At just 37 years of age (born December 18, 1980) Romanian-born Marian Dragulescu has had an illustrious career as an artistic gymnast, both nationally and internationally. Standing 5' 4" tall and weighing an average of 140 pounds Dragulescu has managed to amaze and astound many world-class judges with his strength, grace, flair and precision in the arena of artistic gymnastics, so much so that he has amassed no less than 31 medals during his senior career years to date. Dragulescu, unlike many gymnasts, did not have an interest in gymnastics from an early age, and fell into it as an alternative to karate class that he was keen to avoid. Finding the training to be more than he had anticipated Dragulescu switched to swimming, only to be forced to give that up when the free lessons ended 3 months later. Once again Dragulescu took up gymnastics and so his career as a world-class artistic gymnast began. Arguably his best achievement Dragulescu performed and won several medals at the 2004 European Championships in Ljubljana, Slovenia, where he also gained the all-round title. He won 4 gold medals, an achievement only made by one other gymnast, the incomparable Nadia Comaneci (1975), as well as a number of silver and bronze both in individual events and team events. During his fairly long gymnastics career Dragulescu has retired on two occasions only to return with dedication and a strong desire to excel once again. The first time he announced his retirement in 2005 he left the sport as a competitor and took up coaching, but it was not long before Dragulescu announced he would be returning to the artistic gymnastics to compete once again. Dragulescu again announced his retirement in 2012 and was absent from competition for three years. In 2015, with the goal of competing in the Olympic Games of 2016 (Rio de Janeiro) firmly in his mind, Dragulescu returned to competition once again. Dragulescu missed the opportunity to compete in the 2018 European Championships hosted by Glasgow, Scotland due to requiring minor heart surgery to correct a cardiac arrhythmia. After a brief period of recuperation, he was soon back to competing later in the year when he performed at the 2018 World Challenge Cup hosted by Szombathely, Hungary. Besides being one of the world's greatest artistic gymnasts, Dragulescu has made his mark on the gymnastics world by having a signature move named after him. The move, one that is not easily executed, and many gymnasts have tried and failed to do so, consists of a handspring double front somersault vault with a half-turn. Having a move named after him has ensured that the name Dragulescu will be well-known and respected not only by his peers but by up-and-coming artistic gymnasts in the future. 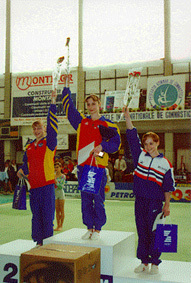 To date Dragulescu has won no less than 31 competition medals both in individual events and also as part of a team performing at various major international gymnastics competitions. Of the 31 medals he has won the majority of them are gold (18). He has also won 9 silver and 4 bronze. In addition to medals Dragulescu has been given recognition in the form of being named Romanian Athlete of the Year in both 2005 and 2009. He was also named 2002 Gymnast of the Year by the International Press Association. Dragulescu's current goal is to proudly represent Romania once again and compete at the 2020 Olympic Games to be hosted by Tokyo, Japan and to add another medal to his already substantial collection. You can read about the women team too. express or implied. romaniangymnastics.ro makes no representations or warranties in relation to the legal information on this website.